I fully recognize that with March completely upon us, I might be the only one still living in a frozen tundra (thank you, Wisconsin), although, I have to admit that we are having rain today instead of snow and that overall it’s been a weirdly warm winter. But since hot chocolate season is abating quickly, I couldn’t pass up the chance to share my latest infatuation. Enter Coconut Tres Leches Hot Chocolate. I mean, seriously, doesn’t the name alone speak volumes? A quick-to-throw-together ensemble of coconut milk, sweetened condensed milk, regular milk (that’s where the tres leches comes from – 3 milks! ), combined with cocoa powder and a touch of vanilla – this hot chocolate is tasty, tasty, tasty. In fact, Brian commented a few hours after downing a mug-full that it was the best hot chocolate he had ever had. That could possibly be attributed to the fact that he had spent the two hours previous to the hot chocolate shoveling the very wet, very heavy snow we had just received and anything would have tasted dreamy…but I’m going to stick with the fact that his insights are spot on and this is definitely some of the creamiest, most delicious hot chocolate we’ve enjoyed. And as I’ve mentioned, in all humility, I do tend to be a hot chocolate snob, so you know it’s gotta be good. In a medium saucepan, combine the milk, coconut milk and sweetened condensed milk, whisking well to combine. Bring the mixture to a simmer over medium-low heat, stirring occasionally so the mixture doesn't scorch on the bottom of the pan. Once simmering, whisk in the cocoa powder until the mixture is smooth. Remove the pan from the heat and stir in the vanilla. Serve the hot chocolate in mugs topped with sweetened whipped cream, chocolate shavings, marshmallows, or whatever else your little heart desires. I discovered this recipe probably 3 months ago and have only made it 10 or so times. It’s perfection in every way! Everyone I share it with asks for the recipe. Thanks for spreading the warmth! I’m stuck in my house with a blizzard outside and all is well cause I’m sipping a mug of pure deliciousness. 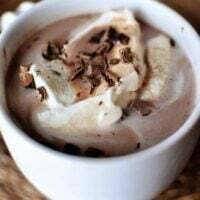 I have decided that this recipe of CoconutTres Leches Hot Chocolate is going to be the toast for our guests on News Years eve 2018! ! ! It sure sounds like a WINNER! ! Thanks! ! It’s look so delicious. I will try to make this recipe. I love how creamy and rich it is!! It makes me happy every time! Thanks for a great recipe! This was out of this world delish! I doubled the recipe but didn’t have two cans of coconut milk so I just used an equal amount of extra milk. It still had plenty of coconut flavor — enough that I will always make it that way for my large family. So, so good. We rounded off the “night of coconut” with your favorite oatmeal, coconut, chocolate chip cookies. I am always amazed that after a year+ of dedicated following of your blog (read: 90% of our meals are from this site) I still come across untried gems. We made this in the Cocomotion and it cooked up beautifully. I was a little worried with how thick it was but it worked great. Delish. I wonder if you could swap all or part of the vanilla extract for almond extract to make it like an Almond Joy Hot chocolate? Anyone ever tried that? I made this with light coconut milk and it was just OK for me. Could be the light coconut milk that made it that way though. I did find that the cocoa powder was very very lumpy, no matter how much or how long I whisked it. I poured it through a sieve several times to try and fix the problem, but never got it really smooth. I think I’d add a second source of chocolate to this recipe to really knock it out of the park (and try it with the full fat coconut milk). I made this last week and it was DELICIOUS!! We loved it- thanks! This was SO yummy we made it twice this week! Thanks Mel! YUM! We had snow again late yesterday afternoon. Since I work in the mountains, I’ll have another month of winter, at least – so a good hot cocoa recipe is more than welcome! this has addiction potential written all over it! marvelous creation, mel! Looks divine! I’m not a huge fan of coconut, but I make a hot chocolate with Almond Milk that I love, bet that would work here, too. I am hosting a bachelorette weekend for a friend – this will be on the list of events for sure. Thank you for another great idea! I lived in WI for 27 years so I totally get it! In fact, I was born in April in the middle of a blizzard! 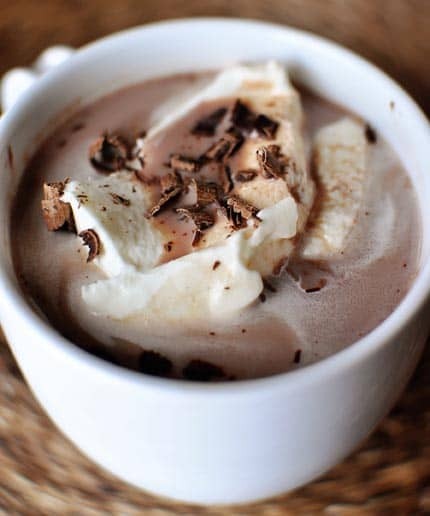 I live in North Carolina now where Spring comes in March but I would still love a cup of this delicious looking hot chocolate! I make your hot chocolate mix all the time. (It really is the best). I love your hot chocolate truffles. (My Husband calls them something rude). So I’m going to have to try this too. The Daffodils blooming outside my window can’t stop me! Any excuse to open a can of sweetened condensed milk sounds good to me!! I LOVE hot chocolate! I can totally relate to still living in cold places… snow was forecast today, but it didn’t actually come. However, in 2009 (when my son was born) Madison, Wi had a high of 70 in Mid-March (and yes I would know this because it was the day after he was born and I was in the hospital for the warm streak! Enjoy the crazy weather in Wisconsin (I’m now a few states away)! this does sound delicious! mm! I was wondering if you’ve ever tried mexican hot chocolate before? You buy the abuelita chocolate tablets at any grocery store, you put milk on the stove and when its warm you put a tablet in and melt it. I believe its 4 cups of milk for every 1 tablet. You add sugar to your liking and I like to put in some cinnamon sticks too! Sooo delicious! Wow, does this ever sound great. YUM. No tundra here, but we have had weird snow falls, very unusual for Vancouver WA. You really aren’t the only one in a frozen tundra. We’re in Alaska and we will have plenty of snow for a few more months! We were just playing outside today and when we came in my daughter was chanting, “cocoa, cocoa!” I guess I need to pick up some coconut milk! Just got in from shoveling snow and had to make this for me and the kids. We all agree that this is the BEST hot chocolate we have ever had. Thanks for the recipe. Your timing was perfect! I can practically smell this from here-it looks divine. We’ve been having strangely warm weather in Chicago, too. It was in the mid-sixties yesterday! This hot chocolate looks delicious! My husband and I are addicted to hot chocolate. We have about 10 cannisters of Stephens cocoa and make some of our own as well. He will absolutely LOVE this. Coconut and Tres Leches are two of his favorite things. Thank you so much for the recipe! You’re amazing. We’ve been enjoying 70 degree weather where I live with the exception of today. This freak storm is coming in and it’s cold (for us)! This post of yours is a dream come true and comes just at the right time. I can’t really imagine anything better. Thanks! 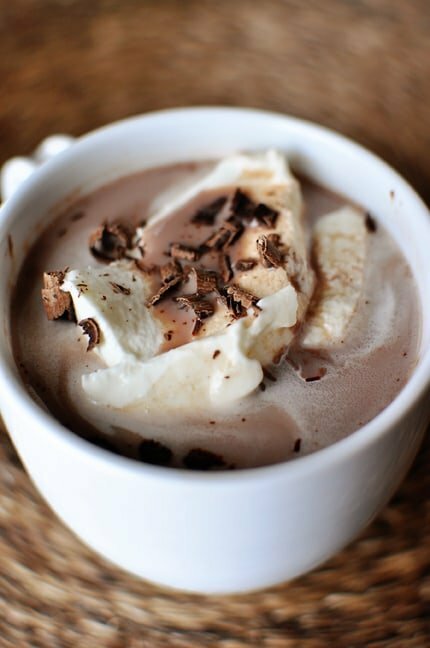 Ditto for our winter (or lack of it) here in MD, but I would still love a mug of this hot chocolate! I want a big mug for breakfast! Oh my – one does not need snow outside to appreciate yummy hot chocolate! Considering your cocount tres leches cake is my FAVORITE cake, this sounds simply delicious!